‘Practical elegance’ pretty much sums up the essence of the Singapore house built at the turn of the nineteenth and early twentieth centuries. These black & white structures embrace influences from England and India, and were adapted for the humid heat of the tropics. There are numerous references to this style of architecture, and together with historical notes from past residents of the Airbase, a clearer picture of how design decisions were made back in the 1930s should emerge. That would be my homework, then. In the meantime, we can answer one of the more common questions from visitors today. How are the houses laid out? 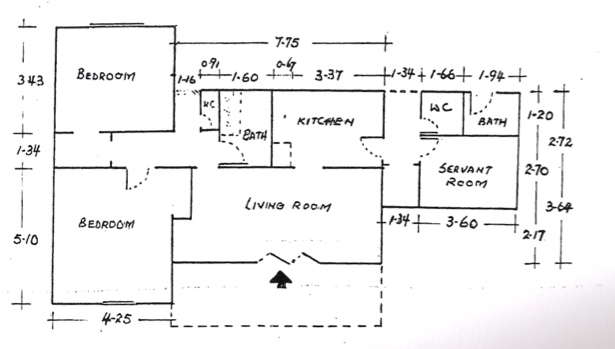 Mind you, these are very rough sketches, but they should give some insight to typical houses. This first sketch is of a bungalow. A 5 metre by 5 metre living room is nice 🙂 The layout is simple, and conducive to letting the breeze waft through. This second sketch is of a typical semi-detached house. The porch is an important feature, most residents today hang out, and often take their family meals where they can be part of the garden.